The Raiders scored four runs in the top of the seventh to earn a trip to the state final. STANDISH — It was stunning, improbable, but only to those who weren’t standing in the Fryeburg Academy dugout Tuesday night. Held to two hits in the first six innings, trailing by three runs entering their final at-bat against top-ranked Wells, the third-seeded Raiders scored four runs on six hits to defeat the Warriors 6-5 in the Class B South championship game at St. Joseph’s College. Chloe Coen had the final hit, a two-run single down the left-field line that gave Fryeburg the lead in an emotional game with huge momentum swings. The Raiders (16-3) – the only team to beat Wells (17-2) in the regular season – will play Old Town (17-2) in the Class B state championship game at 12:30 p.m. Saturday at St. Joseph’s. Fryeburg will make its first state championship game appearance since 2012, when it completed a string of five consecutive regional titles. The game matched two of the best pitchers in the region – Anya Chase of Wells and Nicole Bennett of Fryeburg – but both teams had big innings. Trailing 2-0 entering the bottom of the fifth, Wells scored five runs on six hits with Chase driving in two with a triple, and Sara Ring and Karissa Kenyon getting RBI doubles. Fryeburg’s rally came in the seventh. Bennett led off with a single and was replaced by Alexandria Fraize as a courtesy runner. Fraize advanced on a wild pitch and scored on a single by Makayla Cooper, who was later thrown out at third on a single by freshman Kaylee Emery. But freshman Paige O’Connell singled in Emery, taking second on the throw home, and it was 5-4. Brooke Juneau, a sophomore, reached on an infield single, moving O’Connell to third, and then stole second. Coen followed with a line shot down the left-field line that drove in two runs for a 6-5 lead. Wells Coach Kevin Fox said the rally was simply a matter of the Raiders getting hits. “They did a good job of not giving up and got their bats going,” he said. 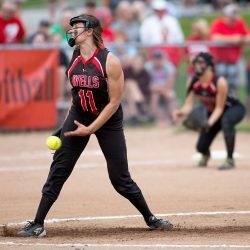 Wells got runners on second and third with two outs in the bottom of the seventh, but Bennett got the final out with a called third strike – “Inside corner,” she said. “I knew it was a strike as soon as I let it go.” – and the Raiders joined in a joyous celebration on the infield. “I told the girls coming down, we haven’t made it easy all year,” said Apt. “We haven’t made it easy on us, we haven’t made it easy on our opponents. We always battle back. And we always give it up a little, like we did in that (fifth) inning. Correction: This story was updated at 11:49 a.m. on June 14 to correct a misidentified player in a photo caption.